​A rich and powerful vocalist and a harmonica player of the highest order (Zicazine 2016) Tracy K’s exceptional stage presence is fortified by her high energy music, with a heavy nod to contemporary and traditional Blues styles. She is considered one of Canada’s only female award winning harmonica players. Her latest release from September 2016 ’What’s the Rush?’ hit number one on Canadian Roots and Blues charts. Accolades about her harmonica playing, dynamic vocals and original songs are still coming in. ​As a performer Tracy K has brought audiences to their feet at many Jazz/Blues/Folk Festivals including the Toronto Blues Society’s Womens Blues Revue, Winnipeg Jazz Fest, Regina and Saskatoon Mid-Winter Bluesfests, Thunder Bay Bluesfest, Winnipeg BBQ & Bluesfest. With her duo and band she has shared playbills from Canada to the Caribbean with musical greats including John Sebastian and Koko Taylor and opened for icons James Cotton and Ramblin’ Jack Elliot. Tracy K has had the distinct honour of being a featured performer/soloist with the Thunder Bay Symphony Orchestra in 2010 and 2015. She was featured at the Toronto Blues Society’s Harmonica Workshop, and was First Runner Up in their Talent Search. 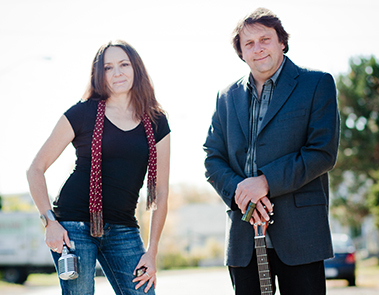 Her awards also include Winnipeg Blues.com Female Vocalist and Harmonica Player of the Year. Tracy K was twice a quarter finalist at the International Blues Challenge in Memphis, TN in band and duo categories, where she enraptured the bustling Fed Ex International Showcase crowd at the New Daisy Theatre and shrunk it down to feel like an intimate venue. An accomplished songwriter, two of her songs won International Songwriting Competition awards and an Ontario Independent Music Award for Best Blues. Tracy K wrote a song for the Hollywood film Scared Silent, for CBC’s Canada Reads, Ontario Rocks, and was featured on CBC’s Canada Live. Tracy K has been featured numerous times in print, television and radio interviews and reviews from around the globe with each of her four releases, which are all mostly original music. Her music is heard internationally on radio and satellite including acclaimed shows like CBC’s Saturday Night Blues. ​Born in Beausejour, Manitoba she was raised on sixties radio and her brother’s hippie records. She started her professional career at twenty five while living in Toronto, singing and playing harmonica and percussion on recordings and live session work. She moved back to Beausejour in the 1990s, started a family and eventually her solo career, inspired by local blues greats Big Dave Maclean and Brent Parkin, and contemporaries Rita Chiarelli, Sue Foley and Suzie Vinnick. Tracy K released her first album in 2000, and after playing the 2002 Inaugural Blues Festival in Thunder Bay, she made it her home. Working contracts as a special needs educational assistant, she supported her three kids while she released two more albums – one with her excellent Right Hand Band and one with her accomplished acoustic duo partner – and picked up seven awards. ​Tracy K took some time after her mother’s passing in 2010 and the empty nesting of her grown children. She would move back to Manitoba in 2014 into the her childhood family home. In 2015 she was invited to be on Ruf Records release ‘Blues Harp Women’ and ‘Mary4Music’s Keeping the Blues Alive Vol.6’. Picking up where she left off, Tracy K is now enjoying progressive success since release of her fourth album ‘What’s the Rush?’ which remains charting months after it’s release. She and her duo partner have a Home Routes tour in 2018 and tour plans keep developing for Tracy K in band and duo formats. Although it’s only her fourth release in her substantial career she’s been anything but stagnate and the proof is in the pudding. She’s a class act with the energy of someone half her age, and a life’s worth of experience under her belt to sing about.